A world class university and a booming high-tech community, could Cambridge be the start-up city for you? Why should you start a business in Cambridge? This ancient seat of learning may be small, but its reputation as a hub of cutting-edge technology is unparalleled in the UK. As might be expected, the University of Cambridge dominates enterprise activity in the city, from which spin-out start-ups and fast-growth businesses abound. For instance University of Cambridge spin-out Improbable, which launched in 2012, has recently joined the leagues of business titans after becoming a ‘unicorn’ on the back of a $502m funding round. Inevitably then, a range of top-class support services are offered to high-tech businesses in particular to sustain that ecosystem. If you are a science business requiring the very latest facilities and technical knowledge, there are few better places to locate and you’re more likely to trade for longer – although, as you might expect, these benefits don’t come cheap. Cambridge benefits from excellent transport links, centrally located just north of London. It is a 45-minute train journey to London King’s Cross, and the nearest international airport is Stansted, 40 minutes’ drive away. Getting around the city should be a breeze, too, with average road speeds of 32.9mph, higher than the surrounding Cambridgeshire region. For most people, the collegiate University of Cambridge needs no introduction. Ranked as one of the top two universities in the country and top five in the world, its facilities, teaching and research are all top-notch. In addition to its globally-renowned peer, Anglia Ruskin University, which straddles Chelmsford and Peterborough too, has more than 30,000 students attending the institution. Against other modern universities, it ranked highly for Psychology, English and History, and offers an array of business services including consultation and research. Because of this, businesses in Cambridge should have no problem at all finding the very highest quality of recruits – the proportion of the working age population with NVQ Level 4 qualifications and above stood at 66.5% in 2016, well above average and higher than rival university city Oxford at 63.4%. With such a pedigree of talent, it’s no wonder recruitment costs are high. Average weekly salaries stand at around £589.10, joint highest on 2017’s index with Oxford. The University of Cambridge’s influence extends well beyond recruitment, with a number of programmes and initiatives designed to support local start-ups. The institution has a well-developed enterprise arm, which essentially works as a business agent for its academics to provide consultancy, expertise and oversight services to industry. It can also help early-stage companies based in the area to find funding and investment opportunities through the university’s own connections. IdeaSpace is an initiative run by the University of Cambridge which aims to support “high impact new ventures” through a membership programme. Members of its “innovation community” will gain access to a network of influential entrepreneurs and investors through the University’s connections, and different membership packages can offer either full-time or drop-in access to its shared workspace locations in the city centre and on the University’s West Cambridge site. Businesses looking for shared workspace elsewhere can also look to the Cambridge Business Lounge. Other services for business offered by the University can be found here; they include recruitment and placements, research collaborations, and conference and event spaces. Elsewhere, Alconbury Enterprise Campus is a new Enterprise Zone located just north of Cambridge near the A1 (M). The location is intended to become a fertile hub for businesses in the advanced manufacturing, low carbon and ICT industries, as well as supporting the commercialisation of research and development. Some of the companies that have so far moved on site since launch, include the University of Cambridge spin-out Enval and development company Mole Solutions. The Zone’s leaders have big plans for Alconbury, with a community of 5,000 homes and plans for a new railway station on the East Coast Mainline. As with other Enterprise Zones, the site offers a business rates discount of up to £275,000 over five years to businesses relocating there, a simplified planning process, and superfast broadband. Other support services unique to Alconbury include support to recruit local people, support and advice on workforce travel planning, and help finding additional funding and support. Known for its “scientific excellence”, the city also boasts Cambridge Science Park said to be Europe’s largest and longest serving centre for commercial research and development. And it houses St John’s Innovation Centre, which specialises in business services for knowledge-based companies as well as running its own incubator. The centre is the regional delivery partner for the government-backed GrowthAccelerator programme. 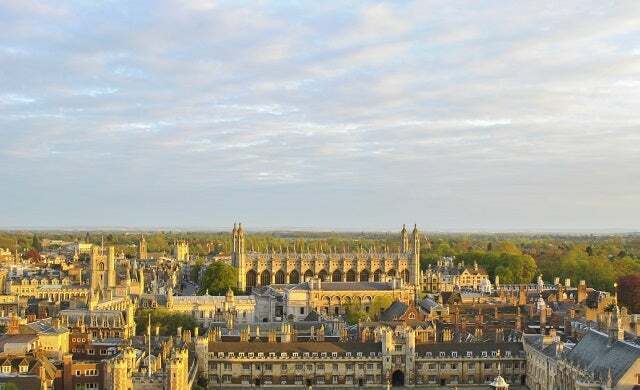 Cambridge is also part of the tech cluster known as the ‘Silicon Fen’ (sometimes known as the Cambridge Cluster), which is home to a large number of high-tech firms focusing on cutting-edge software, electronics and biotechnology. Using the University’s support services, businesses in these industries should have no trouble accessing support and collaboration from the cluster. Business parks the city include Cambridge Business Park, Cambourne, Copley Hill, and Coldhams Business Park. Cambridge currently has just the one accelerator scheme, Accelerate Cambridge, a programme run by the University’s Judge Business School. The three-month programmes combine entrepreneurship training, regular coaching and mentoring, as well as access to shared workspace. Applications are welcomed from pre-idea stage businesses to established start-ups looking to enter their next phase of growth, although at least one company founder must have a “Cambridge connection” to be eligible (student, alumnus, faculty, staff or resident of the town). For businesses looking to install or upgrade connectivity services, the Connecting Cambridgeshire programme works to get businesses across the region connected to superset broadband. While its voucher schemes and funding opportunities are now closed, the page will update if more become available. Enterprise East Cambridgeshire provides advice and guidance on how and where to find business grants in the area and can put your business in touch with relevant organisations. Due to its status as a high-tech start-up hub, the region is well served by angel networks. Cambridge Angels is the most prominent of these; making investments of up to £1m, the group focuses on software, science, technology and biotech businesses. It also benefits from close links to the University, with many of its backers having some connection to the institution. Elsewhere, the Cambridge Capital Group is a set of around 60 investors which, again, focuses on high-tech and technology start-ups in the region. With around 30 portfolio companies, the Cambridge Capital Group has invested several million pounds since its incarnation. Success stories include Bookham Technology, nCipher, and the AIM-listed ITM Power and Bango. With such a diverse array of funding and support for its size, it’s no wonder Cambridge has proved a fertile environment for start-ups. The city comes out top for business survival in our index with an impressive 49% of businesses founded in 2010 surviving through to 2015. Cambridge is a very tranquil picturesque river city, with a large array of attractions for its size due to the large student population. Punting is a popular activity among tourists and locals alike, and the city’s location in the heart of East Anglia means you will have no end of walks and diversions if you are the outdoors type. Other attractions include the Fitzwilliam Museum, Kettle’s Yard and Ruskin art galleries, the Imperial War Museum and Shepreth Wildlife Park. London’s close proximity also means that residents have easy access to more high-energy activities. In terms of cost of living, house prices are fairly high at an average of £446,796, but still substantially lower than London. The crime rate is unusually high for such a small city, at 87.23 crimes per 1,000 population – perhaps due in part to the presence of its large student population. A first-hand account from an early-stage start-up on what it’s like to start a business in Cambridge and what the city has to offer new entrepreneurs. You can also gauge insider opinion on what more Cambridge needs to do to accommodate start-ups.